Much of the $72 million donation that former Duke President Nan Keohane called “a fitting capstone” to the Campaign for Duke has not been paid. William Schlesinger, former dean of the Nicholas School of the Environment, said the school had not received any of its $70 million portion of the donation when he left the University June 1, 2007. 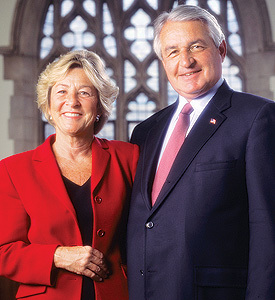 The pledge was made by Peter and Ginny Nicholas in December 2003, when the pair were co-chairs of the Campaign for Duke and Peter was chair of the Board of Trustees. Top administrators, including Provost Peter Lange and Nicholas School Dean Bill Chameides, declined to comment on the donation. Keohane, who stepped down as president in 2004, also declined to comment. The pledge marked the official end of the Campaign for Duke in 2003, a fundraising effort that garnered $2.36 billion in pledges and donations for the University. The Nicholas pledge—the largest in the University’s history when it was made—directed $2 million to Perkins Library and $70 million to the Nicholas School. The school had been named after the Nicholas family following a previous $20 million donation. Duke was supposed to receive the 2003 gift by Dec. 2008, Schlesinger said. He added that Chameides told him in June that little to none of the donation had been received. Chameides declined to comment on the gift. “I come back and see old friends periodically and ask them about this, and numerous people have told me that none of it has been paid up to now,” said Schlesinger, who is now president of the Cary Institute of Ecosystem Studies in Millbrook, N.Y.
Few of the Nicholas School’s announced plans for the pledge have been realized as originally conceived. The University never built Nicholas Hall, a 160,000 sq.-ft. structure that was among the school’s top priorities in its 2006-2011 strategic plan. Executive Vice President Tallman Trask confirmed that the building’s construction was “largely” put on hold due to problems with the Nicholas donation, but declined to comment about further details of the pledge. The school described the building and other plans for the pledge in the cover story of the Spring 2004 edition of “Duke Environment,” a Nicholas School publication. The piece was titled “Investing in the Future of the Environment” and featured a portrait of Peter and Ginny Nicholas. The piece also included plans for the creation of the Nicholas Institute for Environmental Policy Solutions, a new arm of the University intended to provide “high-quality and timely data” to address environmental problems. Although the institute was created, it was not endowed by the Nicholas donation, Schlesinger said. Instead the institute gets additional funding from the provost’s office, he added. Lange declined to comment on how the Nicholas Institute is funded. Nicholas Institute Director Tim Profeta wrote in an e-mail that the Office of the Provost does contribute to the institute’s budget, but declined to specify the amount. In addition to provost funds, the institute is supported by external grants and donations, Profeta noted. Scottee Cantrell, author of the “Duke Environment” article and assistant dean for marketing and communications at the Nicholas School, referred all comment to Michael Schoenfeld, vice president for public affairs and government relations. Schoenfeld declined to comment and said it is University policy not to comment on pledge payments for specific gifts. Although Schoenfeld said he could not discuss the Nicholas donation, he noted in an e-mail that a high rate of pledges from the Campaign for Duke have been paid. Of the $2.36 billion in pledges made during the campaign, more than $2.2 billion have been received, he said. The University has commitments from donors to fulfill most of the outstanding pledges. The $70 million pledge from Nicholas represented a significant portion of the funds raised by the Nicholas School, however. The Nicholas School received a total of $137 million in pledges, or more than twice its goal of $60 million, according to the campaign’s final report. According to “Duke Environment,” including the $70 million pledge, the Nicholas family committed almost $100 million to the Nicholas School—or nearly 75 percent of the school’s pledges from the campaign. Schlesinger said not receiving the gift constrained the school and cited his frustrations with the unpaid pledge as a major reason he chose to leave the University in 2007. “The plans that we had for the school just weren’t going to happen, and there was no indication that they were likely to happen in a few years,” he said.